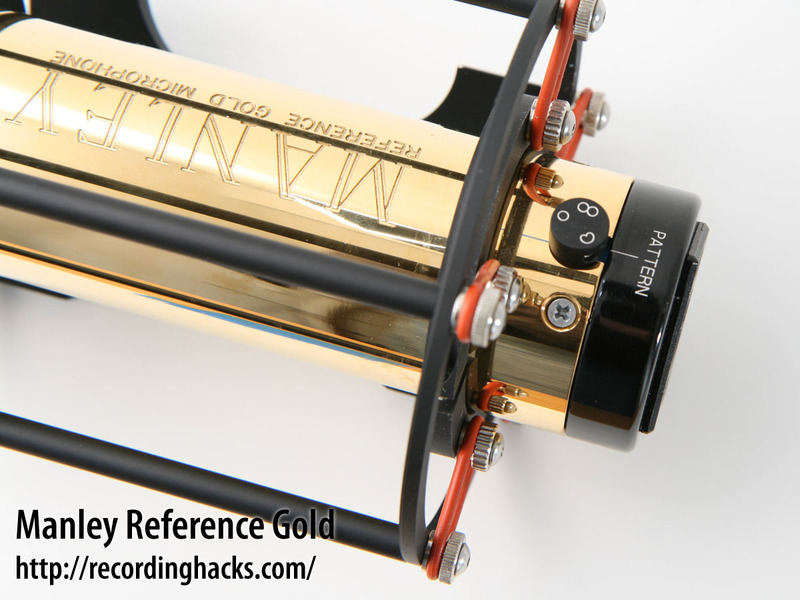 The Reference Gold is Manley Labs’ flagship tube condenser. It combines a multipattern dual-triode amplifier circuit with a CK12-style capsule and open headbasket design. The transformer, body, and grille components are shared with the Reference Cardioid. 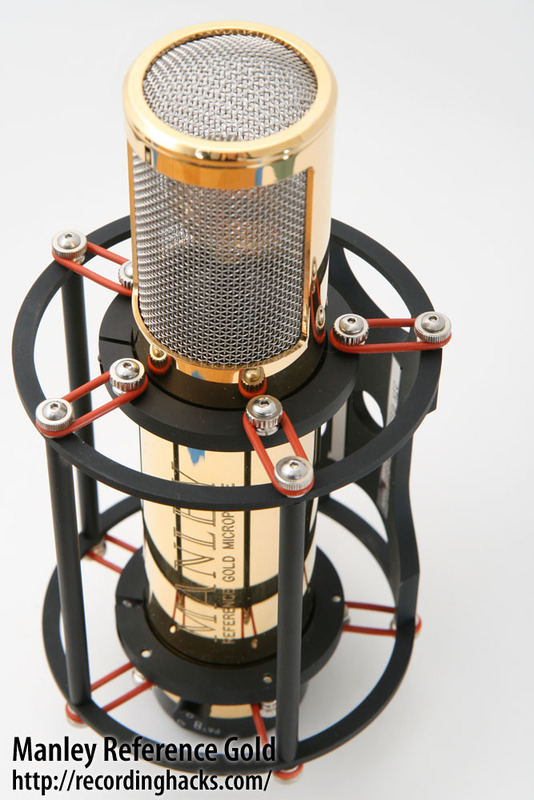 The primary differences between these microphones are the capsule, the pattern control feature, and the gold-plated finish. 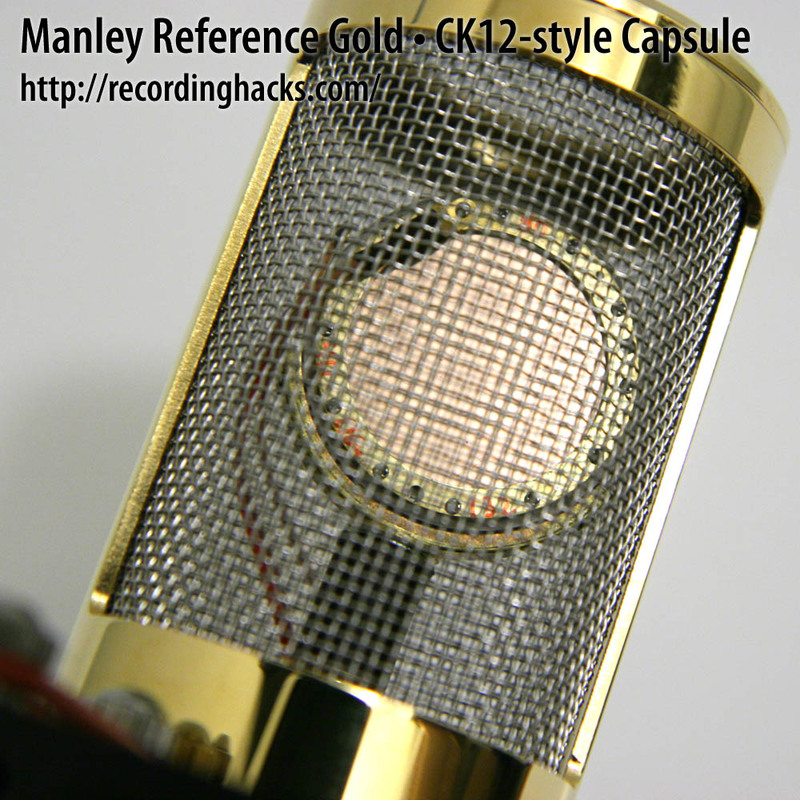 Whereas the Reference Cardioid uses an imported K67-style capsule, the Gold uses a capsule modeled after the AKG CK-12. These capsules are painstakingly handcrafted by Josephson Engineering in California, using proprietary diaphragm-tensioning techniques, German Mylar film, and precision milling machinery. The Gold capsule has a 34mm outside diameter and twin diaphragms made of 5-micron Mylar. This capsule was made with thinner (3-micron) diaphragms through 2001; Manley switched to the slightly heavier film to improve the capsule’s performance in high SPL conditions (in which the thinner film would be more prone to shorting against the backplate). The tube, as in the Reference Cardioid, has changed over this produc’s lifetime, from a 6072 to 12AX7 to, in 2011, a low-noise 12AT7. The tube is socketed, enabling users to swap it as necessary. The Gold’s amplifier circuit is similar to the one used in the Reference Cardioid, with the additional capability of multiple polar patterns. 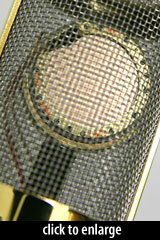 A small rotary control located at the bottom of the mic body enables selection of any pattern from Omni to Figure-8. The pot is continuously variable, not stepped, enabling fine-tuning of the pattern. Remember that proximity effect is primarily affected by polar pattern. Often with vocalists, one wants a certain amount of bass boost… Rather than just hoping that the CARDIOID setting will do the right thing, try adjusting the PATTERN SELECT POT to “dial in” the [desired] amount of proximity… More OMNI will give less proximity effect, while more FIGURE 8 will bring in more lows. In other words, while this is only true for close miking, the PATTERN SELECT can be an effective bass control. Because the pattern control is located on the microphone, rather than the PSU, the Gold shares a PSU and 6-pin cable design with the Reference Cardioid. 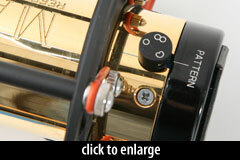 As with the Reference Cardioid, the Gold has a transformer-coupled output. The transformer is described as “employing nickel laminations with ‘hum-bucking’ bi-filar windings, encased in mu-metal.” Since 1994, the transformer has been manufactured in-house by Manley Labs. Prior to 1994, this microphone used a Sowter tranfsormer. The open grille design reduces reflections and standing waves within the headbasket area. For close-miked vocals, a pop filter is most likely required. 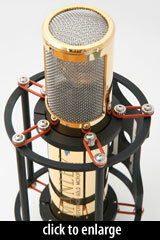 The mic’s distinctive body is machined from brass, plated with 24-karat gold, and fitted to an integral shockmount. The shockmount is designed to stay on the mic at all times, and fits as pictured into the included storage case. Spare shockmount O-rings and a swivel mount are included with the mic, along with the power supply and cable. The entire kit is packed into a rigid plastic suitcase.